This may go without saying, but I do actually wear what I post on this blog. I used to take photos right before I left for work, but that proved to be not only a nuisance to the husband (aka photographer), but it sucked having to rely on daylight and weather to be just right every single day. Not only that, but the husband travels even more than I do for work, so I was basically SOL for photos when he traveled. So, our current routine is that I plan all my outfits over the weekend, then depending on whichever day has better weather - I take all 5 outfit photos on Saturday or Sunday. It's worked out great - definitely less of a strain on our relationship, and it does actually save me time during the week, since picking out an outfit could be the most time consuming part about getting ready in the morning! It's also awesome because I'm actually wearing the outfit the day the post goes live, vs. my post being one day behind real life. So many bennies to doing this ahead of time! That being said, when I'm the one that has to travel, my travel outfit isn't always blogworthy, though you can always catch what I'm wearing on my Tumblr. I feel guilty posting outfits I don't end up wearing, and so since I traveled one day this week, I'm using today (an extra day) to share recent weekend looks. 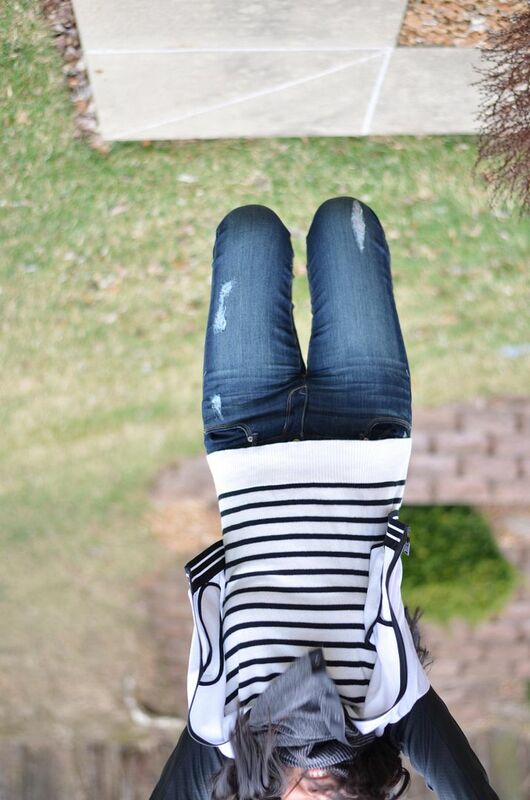 Can you tell I love my distressed jeans?! There's just something easy breezy chic about them - I find myself really trying hard NOT to wear them. One of these days the weather will warm up enough to actually expose more skin. 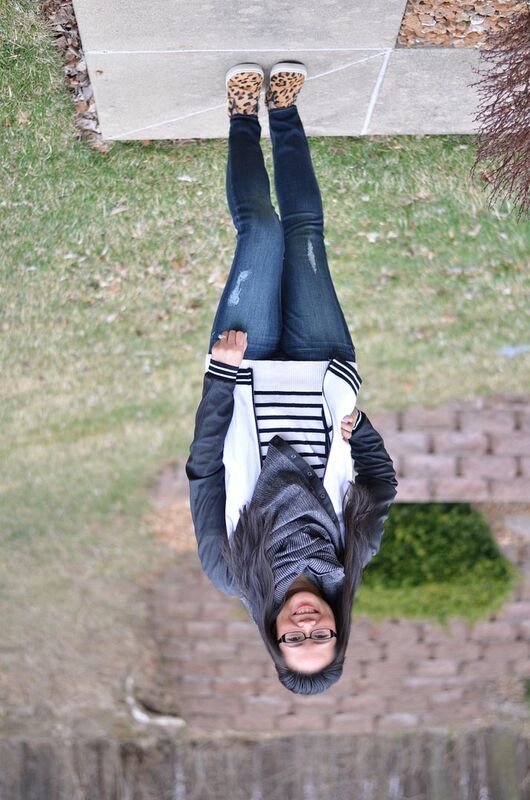 But until then, distressed skinnies it is! Woohoo! Those Kate Spade shoes are a showstopper! I love how they pull out the neon in the sweatshirt. Have a good weekend! Yes, they definitely demand attention! They are just so much fun though, I could not resist!! My American Eagle pair are so great - but man, nothing beats these Stellas. I'm seriously thinking of getting another pair because I freak out that I am going to ruin them one day!! And thank you! I need to wear this jacket more - it's too good not to! I also take all my blog photos on the weekends and I keep my fingers crossed that the weather cooperates :) I love those fun neon pumps! Yes! I always love hearing how other bloggers do it! The weather can make or break your photos! And thanks! The day I wore these pumps, it was so cloudy, I needed to make my own sunshine! I take my blog photos each day and post a day behind. But I like the idea of taking them on the weekend. I might consider it when we move into a house instead of an apartment. 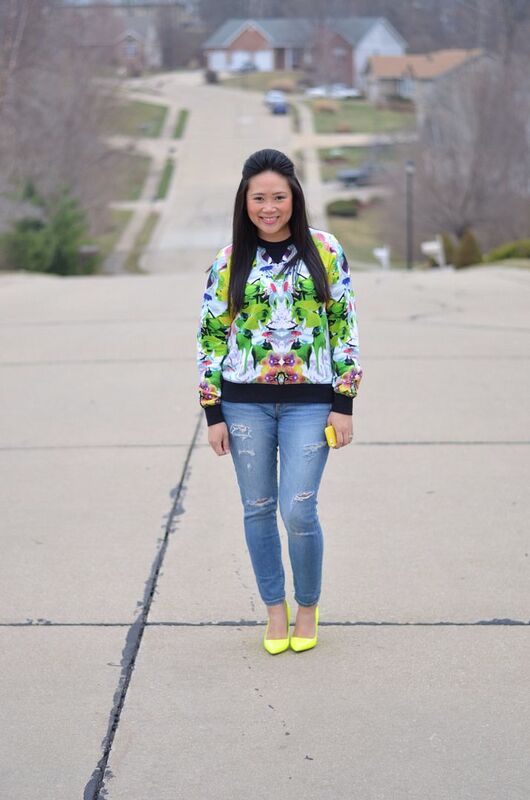 Oh and those yellow pumps are killer with that sweatshirt! Great weekend looks! The bad thing about doing them on the weekend is that by the time the day to actually wear them gets here - I may not feel like the outfit anymore. Or, I'll see the photos and decide that something was off - I've definitely made tweaks to outfits after seeing the photos - which is good for me, but then I do feel guilty like I'm cheating with all my readers! But from a time standpoint - it's definitely proven to be the best for me! Thanks so much for stopping by! That's great! Thank you so much for sharing! I find it so fascinating hearing how everyone fits blogging into their schedules! The neon is so perfect with that sweater. In love! Pre-planning and taking picture on the weekend is a great idea, I might try that soon! I always stress when picking outfits in the morning, so anything that saves time is awesome! Yes, I swear picking outfits takes the longest in my morning routine! So, it's definitely nice to have that step already completed by the time I wake up! It's still around! Just wore it last Friday as a matter of fact! Those heels are fantastic! I think, though, that I love the second look even more - very much my own weekend style! I definitely don't wear heels when I'm running around doing errands and such! That was more for just hanging at the inlaws! I hadn't worn them in forever and figured they needed a day out! I have a feeling the leopard slip ons are going to be my go-to summer shoe! Great looks! I love them both, but the second one is my favorite. I've been on the look out for a pair sneakers like that. I will have to check out the Steve Madden ones. They're really great! I recommend them, and to be honest, I haven't bought a pair of SM shoes in years because they are not usually comfy for me! I love these tho! I adore your shoes both pairs. I am still taking pics as I wear the outfit, but the old Iphone in the office does not make for the prettiest of backgrounds ( LOL) One day I will get a real camera and at least during 3 seasons will move outside. Oh yes, the winter is SO HARD for photos outside! It's tough - so I feel your pain! You do a great job regardless though! I love your heels, such a fun color, and I like even more that you actually wear all of your outfits. Thank you! I do take pride in that! And if something changes and I end up not wearing an outfit on the day originally planned, I feel guilty! Or at least try and wear it at a later date! The whole reason why I started this blog is because I was taking selfies of my ootd posts every day. So I want to stay true to that! But at the same time, be realistic in terms of my time and planning! I take my pictures on the weekends as well, talk about a total time saver during the week and waaayyy less stress. I too am obsessed with my distressed jeans, totally my go to! Have a lovely weekend. Yay! Glad to share something in common with you! It felt like such a big revelation when i realized the benefits to weekend picture taking! Thanks for stopping by! Thanks! 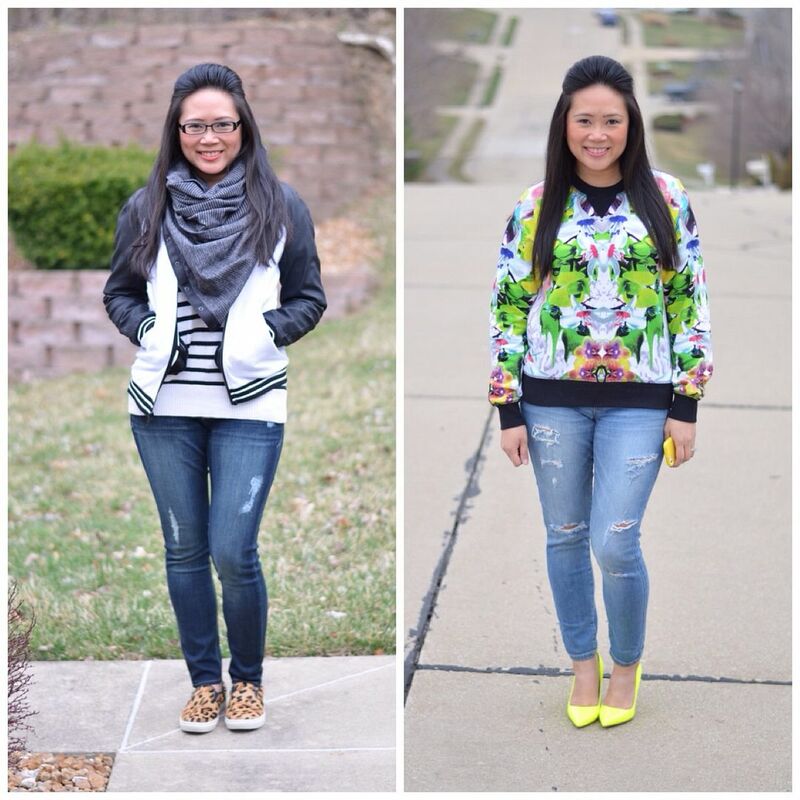 I have been buying a sweatshirt from each Target collabo lately - it's now become a must-have! Hahahaha! Oh, I am so happy to enable! And very flattered that you find inspiration here! Thank you so much! And yes, I def would not and could not do it all if I didn't like it! Oh you are so organised! I'd love to plan out my outfits that far in advance - I do always plan the night before, sometimes I can come up with a few options for a couple of days, but I can never plan much further ahead than that. I take all my photos in the morning as that's the best time here for lighting year round - but it can be a pain if it's raining and I don't want to get the camera and tripod wet! Wow - well that's awesome and makes me appreciate your blog even more! you look so pretty!! those heels though, they're so hot! i was thinking a follow for a follow? Thanks so much for the support! And yes, hot is a good word to describe these heels! Thank you so much sherry! I appreciate you stopping by! I love it and those neon yellow pumps really jazz up the entire outfit - your hubby is a real trooper and I must give him credit. Thank you for linking up again with us at the #WWDParty and sharing your fashion style. Have a wonderful weekend! It's my pleasure! Thanks for hosting! It's refreshing to step outside my fashion blogger peers and see the creative DIY bloggers and foodies in your linkup! I usually take my photos in bulk also. I took two outfit posts today, I'm wearing one of the dresses today but the post will be up later in the week. Working full time makes it hard so I like to plan ahead! Those neon shoes are amazing. Yes, yes it sure does! I don't know mothers who are bloggers do it! Much less mothers who are bloggers who also work full time! I struggle managing my time between work and travel and the blog! But I stick to it because I do enjoy it and love interacting with you and other bloggers! It's a great outlet and break from the stresses of work! I do have a tripod and remote also - actually the second out was taken that way! It's nice to have that option in a pinch, or simply when i want to take photos outside of our weekend "time" and I don't want to bug him! He's definitely a trooper though! Could not do this blog without him and his support! Thank you! It's nice to be able to bring out the cute heels again!! I like who you have styled these outfits especially the graphic top with neon. It looks so fresh and pretty for spring. You have a great smile! Awww thanks for that sweet compliment!! Love the print pull over!! 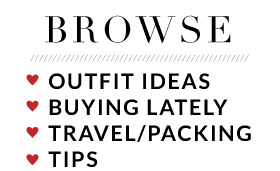 Thanks for posting this alternative so affordable at $31 cool blog following via Bloglovin. Honestly there are some really really good dupes out there! We used to do pictures every day before work, too! It made it so hard if we overslept or had early meetings. Taking them on the weekend has so many benefits!! Yes absolutely! I wish I thought of the a year ago! Would have saved so much hassle!! Yeah I can't promise I can do five outfits a week forever, but for now I'm pushing through! It's definitely a lot of work!! Blogging in general is a lot of work! Great idea to have your outfits for the week in one photo shoot, just takes a little patience, but your hair and make up are done for all outfits which save you time! Love it! 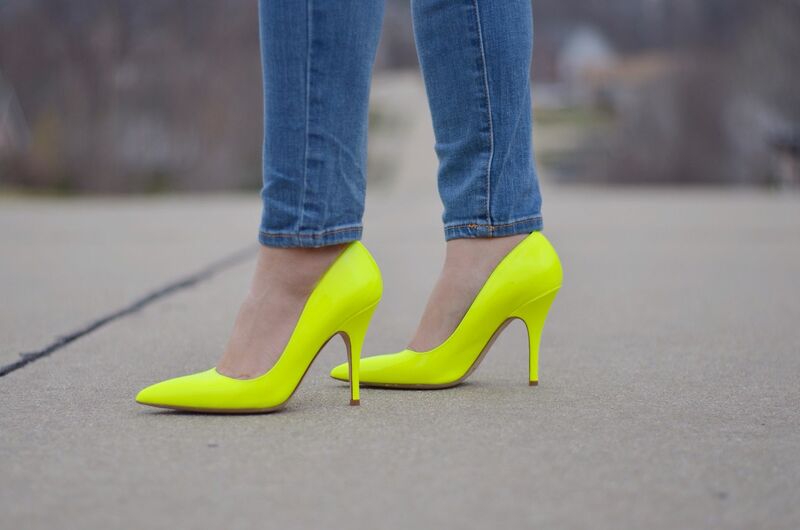 I love those neon pumps, omg, so hot!!! Yep- exactly! I always plan the order of my outfits by how I want my hair so I can just tweak my hair a bit so it's not blatantly obvious it's all the same day! And thanks so so much!! 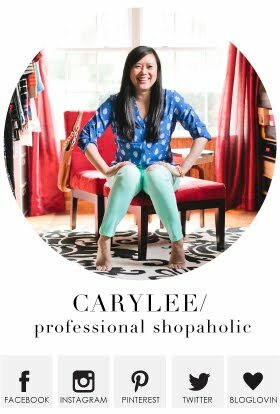 Oh Carylee, those neon heels are fabulous! Great ensemble with those bright coming through so well. I also love your leopard sneakers. yes. Thank you for joining with us at "Fashion item Friday". We had a great time!!! Thanks for popping over to leave this super sweet comment!! And thank you for hosting!